Argan oil and black seed oil are both antioxidants. They are also nourishing and moisturizing to the skin and protect it from damage. Argan Oil, Oil Of Morocco, 1 oz. Argan oil is pressed from the kernels of the argan (Argania spinosa L.) tree in Morocco. It is famed for its medicinal and cosmetic uses. The oil is high is oleic and linoleic fatty acids. In North Africa, the oil is often used as a dip for bread or as an addition to couscous. Research suggests that the oil probably has properties that aid in the prevention of chronic degenerative diseases such as cancer, obesity, and obesity. Medicinaily, the oil is used to moisturize as well as to heal burns. Black Seed Eczema Care Soap, 4.25 oz. A gentle but effective unscented bar soap fortified with botanicals to soothe irritated skin conditions. 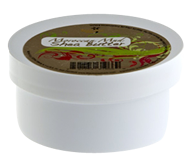 Ideal for eczema, psoriasis and those with sensitive skin. Use a small amount of soap when bathing. Keep the water temperature cool or warm, not hot. Soaking in the tub for a short time can be good for your skin because the skins outer layer can absorb water and become less dry. Soak for 15 to 20 minutes. Then use a soft towel to pat your skin dry without rubbing. Immediately after drying, apply a moisturizer to your skin. This helps seal in the moisture. 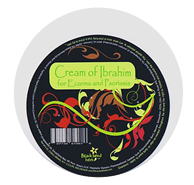 Contains: Sweet Almond Oil, Nigella sativa oil (black seed oil), Flax seed Oil, Calendula, Witch hazel, Oatmeal Powder, Vitamin E.
Cream Of Ibrahim For Eczema and Psoriasis, 6 oz. This cream is an alternative to steroidal preparations that many people wish to avoid. It is formulated to reduce the redness and irritation of scaly rashes that are often associated with auto immune diseases. Apply to entire body as often as needed throughout the day and the night to hydrate and nourish the skin. Pay special attention to any other area of your body that is prone to dry skin. Warnings: For External Use Only. If condition worsens or does not improve after regular use of this product as directed or if local irritation or rash occurs discontinue use and consult a physician. Avoid contact with the eyes, if contact occurs rinse eyes thoroughly with water. Keep out of reach of children. Store between 50 -86 F.
Contains: Aqua (Water), Cocos nucifera (Coconut) Oil, Vitis vinifera (Grapeseed) Oil, Emulsifying Wax NF, Palm Stearic Acid, Vegetable Glycerin, Phenoxyethanol, Xanthan Gum (Polysaccharide Gum), Mannan, Tetrasodium EDTA, Citric Acid,Royal jelly, Honey, Black Seed, Pomegranate oil, Pumpkin Seed Oil, Wheat Germ Oil, Oatmeal, Jojoba Oil, Sweet Almond, Oil, and Vitamin E.
Moroccan Mud Shea Butter Herbal Blend, 6 oz. This Moroccan Mud Butter Melange is scented with frankincense and myrrh. Ghassul Clay (Moroccan Mud) is renown for the minerals that are used for cellular rejuvenation and health. This mélange is especially suitable for those with dry skin. Contains: Shea Butter, Sunflower Oil, Almond Oil, Black Seed Oil, Bees Wax Moroccan Mud, Flax Seed Oil, Olive Oil, Frankincense and Myrrh. Black Seed Amazing Acne gel and healing skin serum clears blemishes with no irritation and is beneficial for other skin problems. This all-natural, soothing gel dries blemishes and acne by absorbing oil, without stimulating oil glands. Soothes as it heals, it is great for bug bites, too! After thoroughly cleansing the skin apply evenly over affected area with a cotton ball and gently rub the face and affected areas. Do not wipe off, let the gel dry. Apply the gel at least twice a day. The complete treatment may require 1 to 2 bottles and last from three to four weeks. Acne Gel is a distilled water based gel, it dries quickly without leaving any traces and it does not stain clothes. It makes it easy to use during daytime, in school or at work. Moreover, there are no problems with using Acne Gel and exposing oneself into the sun. The Acne Gel acne treatment gel aims to expel the blackheads and micro-blackheads from the skin. This is the reason why, after a few applications of the Acne Gel , some people will notice a spontaneous eruption of pimples. Do not get alarmed. This is a sign demonstrating the effectiveness of the curative virtues of the product, which pushes infected blackheads to the surface and purifies the skin. Acne Gel uses this process to prevent papules (inflammation and redness of the dermis) and, a few days later, the pimples will dry up and disappear completely without leaving any traces on the skin. Note: Acne Gel's purifying effects also act on other skin conditions.It can be used alone or under other skin products. For external use only. Contains: Steamed distilled water, aloe vera, witch hazel, black seed (Nigella Sativa) oil, peppermint essential oil. Peppermint Foot Butter, 6 oz. This penetrating ointment contains refreshing peppermint and soothing lavender to invigorate tired feet. It can be used to moisture as well as to inhibit the growth of bacteria and repair cracked heels. Contains: organic olive oil, black seed oil, comfrey oil, peppermint essential oil, chamomile essential oil, rosemary essential oil, lavender essential oil, aloe vera, vitamin E, shea butter, and beeswax. Pomegranate and Green Tea Anti Aging Cream, 1 oz. This is a moisturizing, non-greasy skin treatment to help people avoid wrinkles and other signs of aging skin. 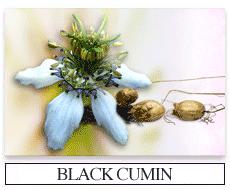 The herbs are nourishing to the tissue and the oils aid penetration and elasticity of the skin. Apply daily, morning or night all over face and body for comforting hydration. Thoroughly massage areas where moisture is needed. Contains: Pomegranate Oil, Green Tea Extract, Steam Distilled Water, Infusion of Organic Herbs, Golden Seal, Licorice Root, Mullien Leaf, Marshmallow Root, Red Clover Blossom, Black Seed Oil (Nigella sativa), 100% Vegetable Glyceryl Stearate, 100% Vegetable Cetearyl Glucoside, Borage Oil, Sunflower Oil, Honeysuckle Extract, Rose Oil, Grape Seed Oil, Xanthum Gum, Jojoba Oil, Retinyl Palmitate (Vitamin A), and Tocopherol (Natural Vitamin E).